I took a needle felting class at my local public library! 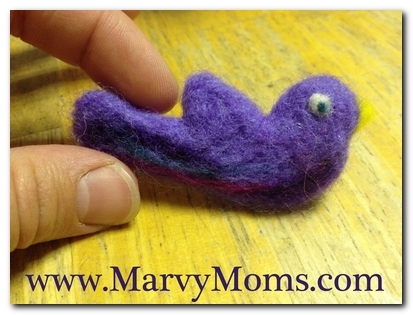 If you haven’t heard of needle felting, Google it! I knew I was interested in felting after I discovered these adorable owl earrings on Etsy that I had to have, but I didn’t know it could be so easy and enjoyable. For an entirely reasonable price (I’m too broke to get a haircut, if that gives you an idea of what I find reasonable), I spent an hour making a small bird using a cookie cutter as my guide and getting started on a tiny white wolf. The registration fee provided the instruction, foam block, needle, roving to use during the class, and extra to take home. 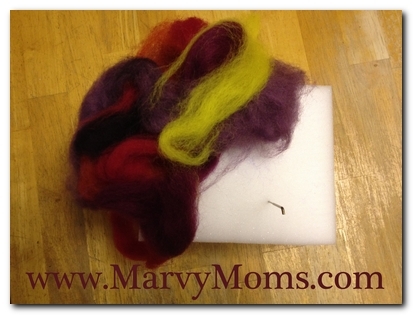 Roving, foam block, felting needle. I left the library with a sense of excitement, creativity, and community. I forget that it’s okay to do things just for me, just because I want to. It’s way too easy to get caught up in the daily, weekly, and monthly flow of taking care of what feels overwhelmingly like everything, for everyone else. Don’t misunderstand, I love my responsibilities and I have a huge support network. I love my child, my family, that I have a room that gets messy and a car that needs cleaning, homework that is sometimes late and a job that although wonderful, is still work. I sometimes forget to nurture my creative side, my quiet side. My first creation! I didn’t even bleed when I stabbed myself with my needle, though Band-Aids were provided. So I want to know, does your community offer creative classes like this? Have you taken advantage of them? How do you de-stress and take time for yourself?